A free Affidavit of Heirship form is used to transfer real property instead of going through probate when a person dies without a will. 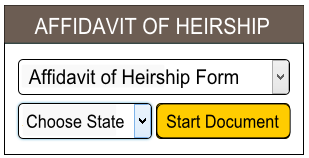 An Affidavit of Heirship should only be used when all heirs agree to not probate the will. An Affidavit of Heirship is needed to identify the heirs of the estate and gives notice to the court that a person has died intestate, or without a will. If a person dies without a will, Heirship proceedings could be undertaken to determine the heir to the property. Most of the time it’s the surviving spouse and heirs of the decedent. During an Heirship determination proceeding, the court determines the heirs and who will inherit the estate. Instead of going through the probate process to receive title to property, the heirs can file an Affidavit of Heirship in deed records of the county where the real estate was owned by the Decedent. Once the Affidavit of Heirship is signed and filed in the deed records, it links the title of the real estate to the heirs. It is at this time, the heirs are allowed by law to transfer ownership of the property. This Affidavit of Heirship must be completed by a third disinterested party (Affiant) who will not benefit from the decedent’s estate. Do not complete this form if the decedent left a will that was probated in court or there has been some other type of court determination to the estate. THIS FREE AFFIDAVIT OF HEIRSHIP FORM MUST BE FILED IN THE COUNTY CLERK’S RECORD.